This morning I posted a recipe for some completely decedent and completely delicious Chocolate Chunk Cookies. It only seems fair to share these wonderful cookies with others so this afternoon I'm going to show you a fun way to package them. 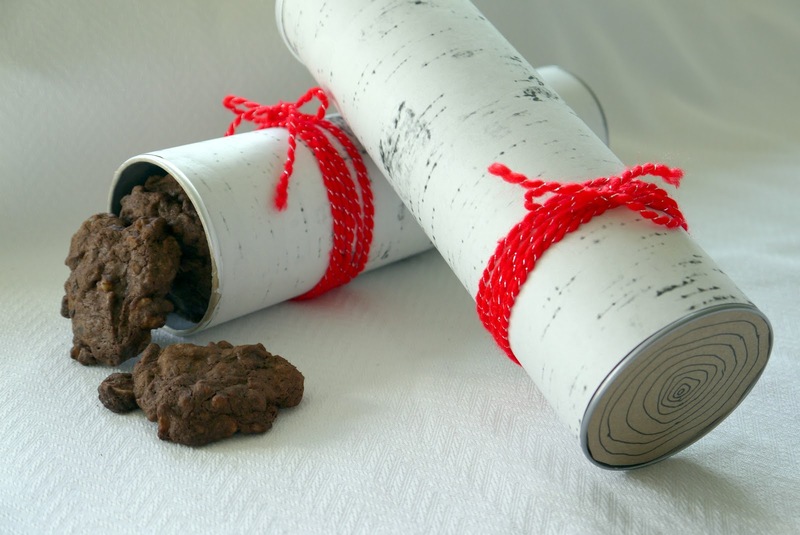 Just a word about the birch bark paper . There are lots of different places to get birch bark backgrounds on the internet. I used the one I mentioned above, from Martha Stewart, because it had nice even markings. I did do a few things to it though, before I printed it. In order to stretch the image to fill an entire piece of paper, I took a screen shot and put it in Paint and then saved it. I then opened it in Picnik so that I could stretch it. I also darkened the image somewhat as I found it a bit faint when I printed it. If you find you are having difficulty with it then let me know and I'll email you the sheet I used. 1. 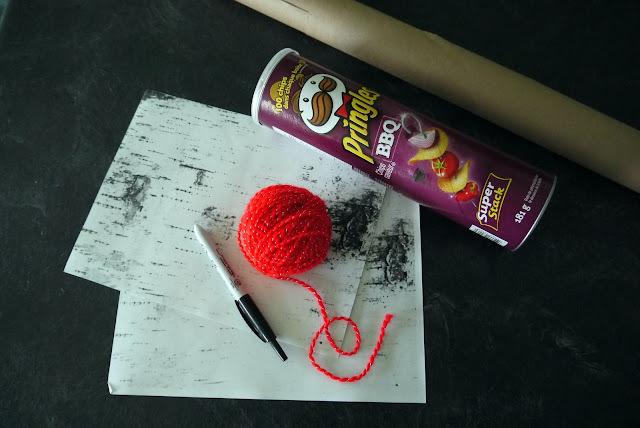 The first thing you need to do is eat the Pringles and wipe out the inside of the container - you don't want your cookies tasting like barbeque chips (I also suggest wrapping your cookies in plastic wrap or putting them in a cellophane bag inside the container for the same reason). 2. Glue the birch bark paper around the canister. 3. Trace the end of the canister onto the brown paper roll and cut out two of them. 4. 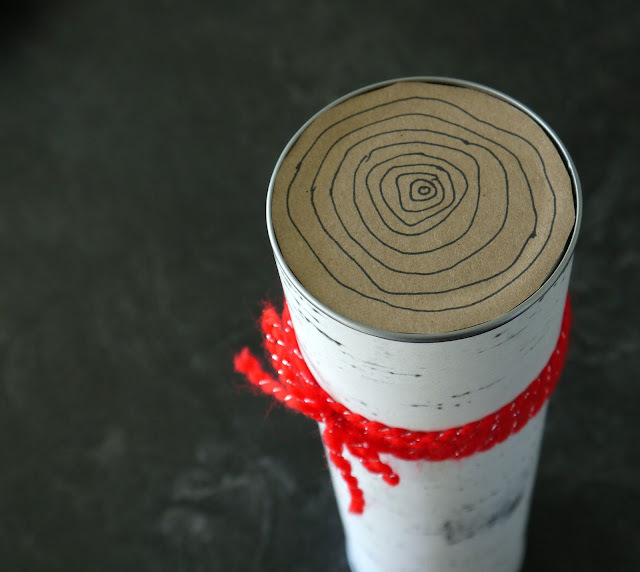 Draw the growth rings onto the brown paper and glue one on each end. 5. Wrap the yarn around the log to make it all pretty (and to cover the seam between the pieces of paper). 6. 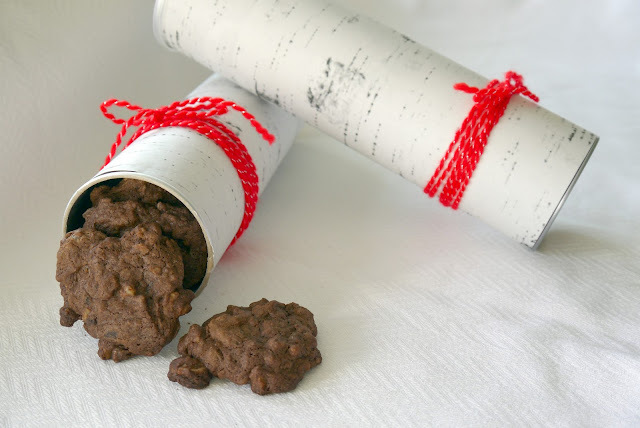 Fill the canister with yummy cookies and deliver it to someone special. Can you believe it's already Day 3 of Christmas Cookie Week. Angie and I have been cooking up a storm so be sure and check out what she has made at Echoes of Laughter. 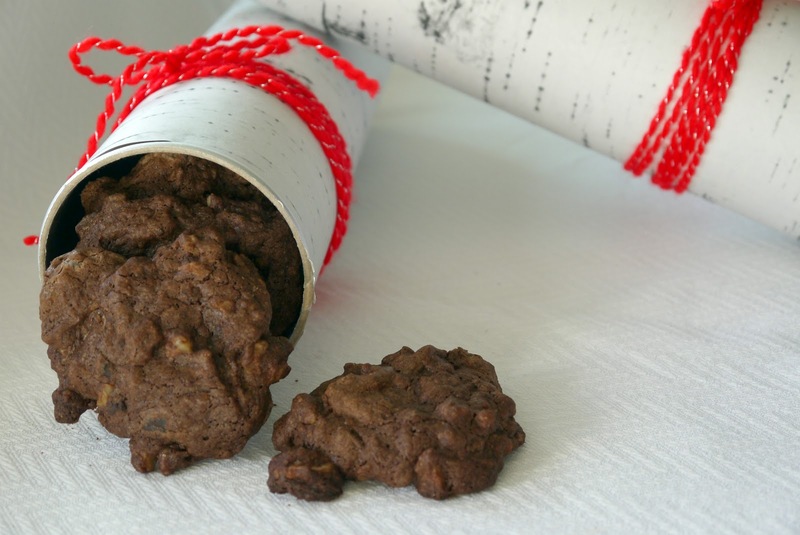 Come on back tomorrow for yet another delicious cookie recipe in the morning and a way to package it in the afternoon. What a great idea! I am starting to see birch popping up, you are on the leading edge of a hot new trend! What a wonderful idea! And thanks so much for explaining how you created yours in Picnik. I like that idea. What a great idea for packaging. It is cookie exchange time here and I will definately use this idea. Thanks for sharing. Copyright © Grace: Sense and Simplicity. Please credit me if you borrow any personal images or text from this site. Julie's Little House Has Been Sold! The Best Bathroom of All Time! Who Doesn't Love Granola Bars? Getting the Hang of Nature in Macro! Hit 'Refresh" and head south!